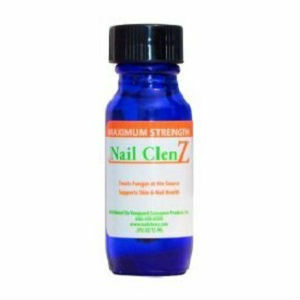 NailClenZ is a product that treats nail fungus. It hits fungus at the source to rid the user of irritating and itchy fungus in a hurry. It comes in a bright blue bottle that stands out among the crowd. But is NailClenZ just pretty packaging, or is it a product you should try? Clotrimazole USP is a compound that prohibits fungus from growing on the nail. Barbadensis Leaf Juice, or aloe, is a moisturizing compound that leaves skin and nails stronger, itch-free, and gives you the ability to heal quickly. Vitamin E supports healthy skin regrowth throughout the treatment process. Menthol alleviates any skin irritation that can be caused by Clotrimazole USP. These ingredients work together to heal infections and prevent the spread of more fungus after symptoms disappear. NailClenZ comes in a blue bottle with an easy-to-use and convenient brush applicator. The formula works immediately to relieve irritation. Users should apply once or twice daily until symptoms go away. For nail infections, users should continue use for the entire regrowth cycle, about 3 – 12 months. Some users experience irritation or discoloration due to Clotrimazole. Side effects are generally temporary and minimal. A 3-month supply of NailClenZ can be bought from the manufacturer for $49.95. If you buy two bottles for $99.90 you receive one free. For severe infections, you can purchase three bottles for $149.95 and receive two free bottles, saving $99.90. Plus, they offer an attractive 60-day guarantee; so you know you won’t be wasting your money if NailClenZ doesn’t work for you. NailClenZ offers a great product with plenty of information regarding its ingredients, but there are cheaper and more effective products out there. Click here to learn about our Top Nail Fungus Treatment Products. Jack Stevens	reviewed NailClenZ	on June 21st	 and gave it a rating of 3. Copyright © 2019 ToeNailFungus.Center- All Rights Reserved.